The bad news is that you have to get up an hour earlier this week because daylight saving time has ended. The good news is that if you're up before the sun, you'll witness a beautiful triple conjunction of the moon, the planet Venus, and the bright star Spica. Most of us in North America are getting up an hour earlier this week thanks to the end of daylight saving time. If you're willing to get up a little earlier still this weekend, you will witness a celestial treat: a triple conjunction of the waning crescent moon, the brilliant planet Venus, and the brightest star in the constellation Virgo, called Spica. Many people don't realize how fast the moon moves across the sky until it passes close by a bright landmark. In this case it will be moving past both Venus and Spica. On Saturday morning (Nov. 10), the moon will be quite far to the right of Venus. On Sunday (Nov. 11), it will have moved much closer to Venus, forming a tight triangle with Venus and Spica. By Monday (Nov. 12), the moon will be well below and to the left of Spica —quite low in the sky and probably hard to see. During this time, take a close look at the moon to look for the dim side of its globe lit only by Earthshine, which is sunlight reflected from the Earth. If you do watch all three mornings, see if you can detect Venus' movement relative to Spica: the two bodies are getting closer, heading for a minimum distance on the morning of Nov. 17. The view will be best Sunday morning, when the three are closest together, but worth a look any morning this weekend. 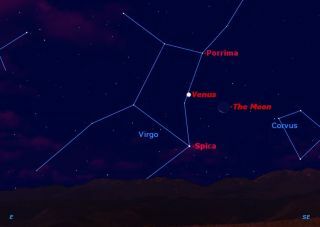 While you're up, set up your telescope and have a look at Porrima, the second brightest star in Virgo. It is a close double star requiring at least a 75mm telescope to see the two stars separately. Many astronomers have forgotten that Porrima is a double star because it has been too close to split in even the largest telescopes in recent years, but it has now opened up enough to make a pretty sight at high magnifications.